The research domains in which I am going to conduct my research is best explained by Figure 1.1. A full line signifies that the relationship between the two domains is subject to my research. The dashed lines signifies relevant relationships which is not explicitly subject to my research, but they are relevant for my research. My problem domains are FLOSS, HISP, Ethiopia and the Tigray health bureau. I am going to concentrate on the relationship between FLOSS and Ethiopia, FLOSS and HISP, and between HISP and the Tigray health bureau. My research will be conducted using the framework of structuration theory and a social informatics perspective on technology. This will all be explained in chapter 2. I have three primary objectives for my research into the previously mentioned research domains. This objectives will be presented in the following paragraphs. Research objective 1 – Explore the structuration of FLOSS. Through this research I want to learn about the structuration of FLOSS and common social practices of the FLOSS community. I will give special emphasis to the practices of source code sharing and distributed voluntary development. My exploration of the structuration of FLOSS will serve as an introduction to FLOSS for those who are not familiar with the FLOSS community, and will serve as background information for my case studies. Research objective 2 – Explore how Ethiopia can benefit and are benefiting from FLOSS. I want to explore the current use of FLOSS in Ethiopia, and equally important I want to explore the participation of Ethiopia in the global FLOSS community and the institutional support for FLOSS in Ethiopia. Since Ethiopia is a developing country I will also do research into how FLOSS can benefit and are benefiting developing countries in general. This research will be based on the concept of knowledge translation and how FLOSS facilitates knowledge translation. The transfer or translation of knowledge and technology, is important for bridging the digital divide. Based on the findings from this research objective and from research objective 1 I will discuss how Ethiopia better can benefit from FLOSS. Research objective 3 – Explore how HISP can benefit and are benefiting from FLOSS. HISP develops, support and distribute/translate the FLOSS licensed DHIS software. Through my research I want to find out why the DHIS software was licensed in this way and how this benefits the translation process, which DHIS undergoes in each local context where DHIS is used. 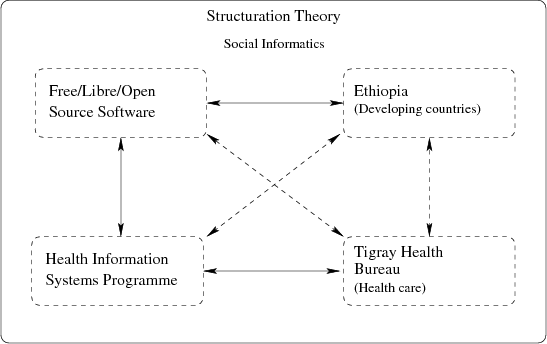 My work in Tigray was primarily to translate DHIS into the local context of the Tigray health system. I also want to explore the development of DHIS and the differences between the development of DHIS 1 and DHIS 2. I want to compare the social practices in the current DHIS 2 development with social practices common in the FLOSS community. Based on the findings from this research objective and from research objective 1 I will discuss how HISP better can benefit from FLOSS.